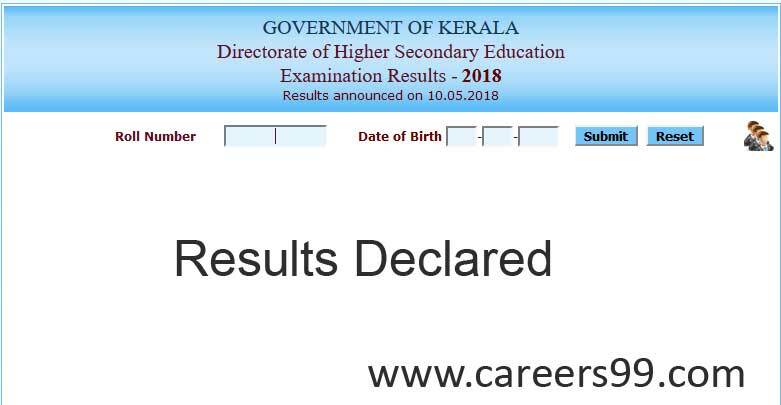 Kerala plus two results 2018: The Kerala intermediate results 2018 are to be announced today on the official website- keralaresults.nic.in. Students get ready for the results 2018. Candidates who are very anxious for the results can check their results on the official website. The Kerala plus two examinations are held from March 7 to March 28 this year. Candidates who want’s to know the latest updates stay tuned to get the latest updates. The Kerala Intermediate (plus two) examinations (DHSE) were conducted in the month of March that is from March 7-March 28. The DHSE results are to be announced today. People can check the results on the www.keralaresults.nic.in. After releasing the results, a lot of students check their results more traffic occurs the server will be overloaded. So the Kerala board offers to check the results in other websites-indiaresults.com, careers99.com, etc..,. Around 4.5 lakh students had attended for the Kerala Intermediate (plus2) examinations. The Board releases the class 12th results in online mode. In the year 2017, Kerala class 12th results the last year pass percentage was 87%. About 4.5 lakh candidates had attended for the Kerala board of class 12th examinations. Most of the candidates had cleared all the examinations. This year 2018, more than 87% are expecting this time. Candidates who did not have any internet connection, for those people Kerala Board introduce to check the 12th results 2018 via mobile SMS. Kerala12<space>hall ticket number and send it on 56263. Kerala board will give the details of your class 12th results. After checking the Kerala class 12th results 2018 download the copy for the future reference. Students can also get their results via SMS by sending the message ‘KERALA12<REGISTRATION NUMBER>’ to 56263.